Charlie Blackmon on his home run. Credit: Russell Lansford, USA TODAY Sports. Walk-off against the world champs. 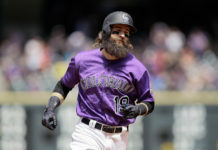 The Colorado Rockies defeated the Houston Astros in walk-off fashion Wednesday night, 3-2 with Charlie Blackmon’s bomb in the bottom of the ninth. Not only did they score the final run, the Rockies scored the first run of the ballgame as well, in the bottom of the second inning. After watching two consecutive balls cross the plate to work a 2-0 count, franchise legend and cornerstone Carlos Gonzalez blasted a four-seam fastball into the stands in right field, establishing an early 1-0 advantage for Colorado. The Astros answered in the fourth inning where they took the lead by scoring a pair of runs. Rockies’ starting pitcher Jon Gray struck out George Springer to begin the inning and then proceeded to walk Alex Bregman. From there, Astros’ second basemen Jose Altuve ripped a double to deep right center field to push the first run of the ballgame across the plate for Houston, evening the score at a run apiece. The second run came via a groundout hit by Marwin Gonzalez to give the Astros a 2-1 advantage. 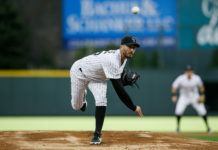 The game then developed into a pitcher’s duel with neither team able to pull in front due to the sharp pitching from the respective starting pitchers. However, the Rockies did manage to put together a bit of a rally in the bottom of the seventh inning, which started with catcher Tom Murphy hitting a single to right field. Raimel Tapia then pinch hit for Gray and failed to lay down a sacrifice bunt to advance Murphy, leaving the Rockies with a runner on first base and one out. Blackmon proceeded to work a walk which was followed by Ian Desmond hitting a single to right field to load the bases for the Rockies with All-Star Nolan Arenado due up. With the bases juiced and one out, Arenado quickly got down in the count 0-2 and then fouled off the third pitch. On the fourth pitch of the at-bat, Arenado hit a weak fly ball in foul territory that Astros’ third basemen J.D. Davis caught while falling over into his teams’ dugout. With the catch, the ball was live, which allowed Tapia to score from third base to even the game at two runs apiece. 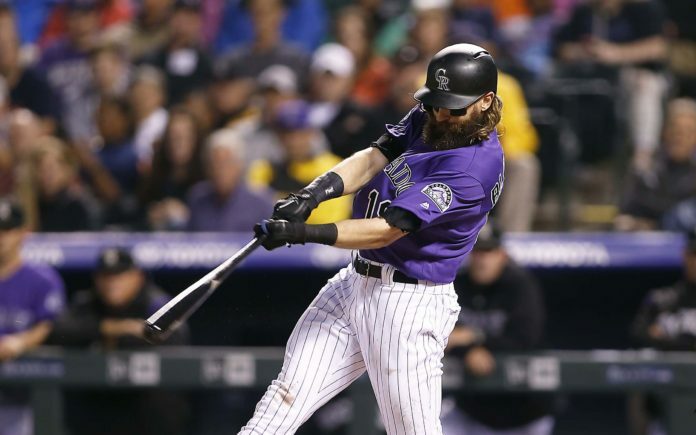 With the game tied at 2-2 in the bottom of the ninth inning, Blackmon decided to take matters into his own hands by launching a towering home run to center field on a 3-1 fastball to seal the victory for Colorado and end the night in thrilling fashion. Lost in the exhilarating ending to the ballgame was the start from Gray. Gray finished with a line of 7.0 IP, allowing just one run off one hit while striking out six batters. The Rockies are off Thursday before starting a three-game set against the Oakland Athletics Friday night with first pitch set for 6:40 p.m. MST. 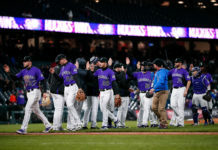 The Rockies split the short, two-game series with the Houston Astros after losing a heartbreaker 8-2 on Tuesday night, going to extra innings tied 2-2. This game was even more huge because it’s a win before an off night for the Rox. Colorado now sits at 54-47, 1.5 games back of the L.A. Dodgers and 0.5 games back of the Arizona Diamondbacks in the NL West. It was the first career walk-off home run for Charlie Blackmon.